Am 03., 04. und 05. Mai konnten wir Geburtstage feiern: Amaryllis, Bienchen und Bonsai wurden ein Jahr alt. Und zusammen mit Bonsai hatte auch Merlin Geburtstag, der nun schon 3 Jahre alt ist. Herzlichen Glückwunsch Euch vieren und natürlich auch Euren Geschwistern, die nicht mehr bei uns wohnen. Am 04. Mai pünktlich zu Bumblebees Geburtstag haben wir den neuen Catwalk-Kratzbaum bekommen. Tinky und Melissa waren ganz mutig und haben die Aufstellung aufmerksam beobachtet (Foto). Unerwartet wurde unsere Biene schwanger und erwartet Anfang Juni 2006 ihre ersten Babys. Eigentlich sollte im Juli zunächst Tinkerbell gedeckt werden und daher bekamen alle Mädchen die Pille. Bei Bienchen hat sie allerdings nicht so richtig gewirkt. Der Vater ist unser Crispin, der offensichtlich im alter von 7 Monaten bereits “ein ganzer Kerl” war. Nachdem der erste Schrecken überwunden ist, freuen wir uns nun auf Bienchens Nachwuchs und richten ihr das “Kinderzimmer” her. El 03, 04 y 05 de mayo podríamos cumplear: Amaryllis, Bumblebee y Bonsai tuvieron un año. Juntos con Bonsai cumpleó Merlin, que ahora ya tiene 3 años. ¡Feliz cumpleaños a vosotros cuatro y por supuesto también a vuestros hermanos que ya no viven con nosotros. El 04 de mayo puntual al cumpleaños de Bumblebee recibimos el árbol de gatos nuevo de la empresa Catwalk. Tinky y Melissa estaban muy valiente y muy atentos nos observaron coloquiendo (foto). Imprevisto nuestra Bumblebee volvó embarazada y espera sus prmeros bebes a principios de junio 2006. En el fondo el plano era que Tinkerbell ira a un gato de primero en julio, por eso todas las hembras recibían la píldora. Pero con Bumblebee no surtía efecto. El padre es nuestro Crispin que aparentemente ya era todo un hombre con sólo 7 méses. Después del primer susto, ahora nos alegramos de la descendencia de Bumblebee y lo esperamos. On 3rd, 4th and 5th of may we could celebrate birthdays: Amaryllis, Bumblebee and Bonsai became one year old. And together with Bonsai also Merlin had birthday, who’s age already is 3 now. Congratulations to you four and naturally also to your brothers and sisters, who do not live no more with us. On 4th of may punctually to Bumblebees birthday we got the new Catwalk scratching tree. 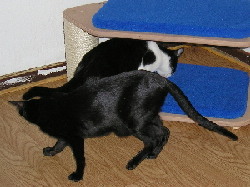 Tinky and Melissa were very brave and watched me building up the scratching tree (photo). Unexpectedly our (bumble)bee became pregnant and expects her first babies at the beginning of june 2006 . It was really planed that at first Tinkerbell should have been sent to a stud in july to become mother and therefore all my queens got the pill. With Bumblebee it did not work. The father is our Crispin, who was obviously at an age of 7 months already able to make babies. After the first shock was over we descided to wait for their offspring and prepare ourselves by preparing the children’s room.